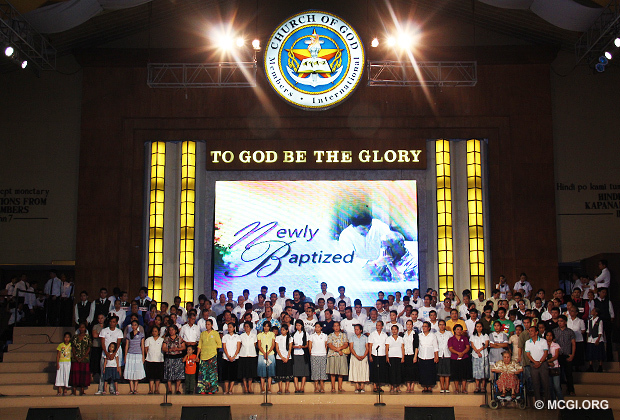 For the more than thousands newly-baptized during the first Mass Baptism of 2013, new broadcasting facilities, and more, Bro. Eli lead the brethren in offering the sacrifices of thanksgiving last January 26 this year. Around 1,200 new members were added in the fold, mostly coming from so many different religions and nationalities. This was accounted to by Bro Eli as the primary reason of his thanksgiving offering that day. Hence, loud cheers and appreciation greeted the announcement of thanksgiving by the Presiding Minister to the Members Church of God International (MCGI). A Mass Baptim in the Church of God is held twice a month, following after more or less two weeks of Mass Indoctrination. The latter is a series of Bible Study sessions of Christ’s complete doctrines that anyone who wishes to be a member of MCGI needs to undergo. 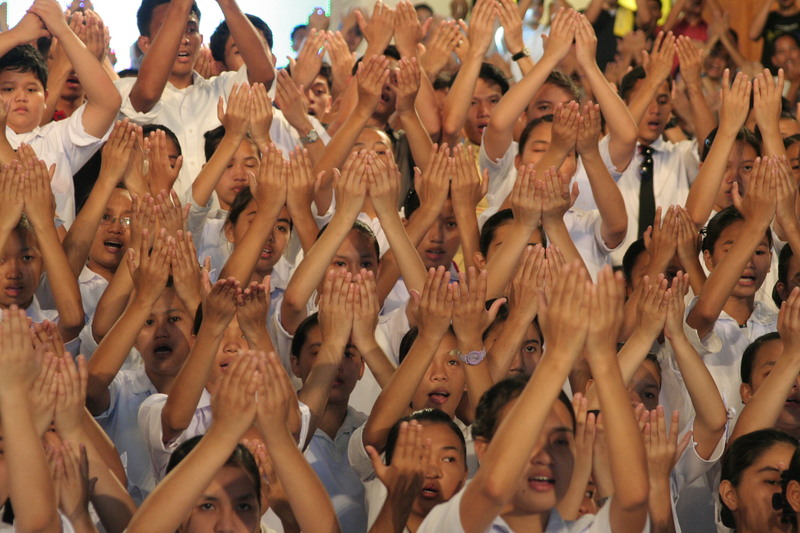 Mass Indoctrinations are officiated in all Ang Dating Daan (The Old Path) coordinating centers worldwide. Some of the newly baptized members from the Mass Baptism of January 2013 singing an offering to God at the ADD Convention Center stage. The phenomenal growth of the membership in MCGI is hardly surprising. Every Mass Indoctrinations that are being opened, Bro. Eli and Bro. Daniel Razon said that they are receiving reports of overwhelming response, especially abroad. Hence, new members in faith are added in more than a thousand every month. As it is written in the Bible that the heavens rejoice for even a single soul that repents (Luke 15:7), it is but expected for members of the Church of God to be celebratory. In his thanksgiving offering for the baptism of a thousand from the Philippines and other parts of the globe created a grand celebration, Bro.Eli acknowledged God who made this all possible. Television remains the top reason cited by the newly-baptized for learning of the Truth that Bro. Eli is preaching. Hence, if not for the programs like “Itanong Mo Kay Soriano, Biblia ang Sasagot” (Ask Bro.Eli, the Bible will Answer) and “Ang Dating Daan” or The Old Path in the Philippines and English speaking countries, awareness about the existence of MCGI would not be possible. 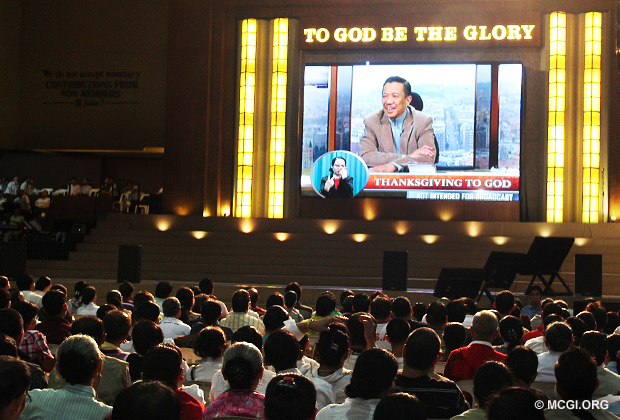 With the addition of a new satellite dish that were installed, enabling the broadcast of MCGI programs geared for the English-speaking countries, the Church will be able to reach more people. Bro Eli Soriano teach the Members of the Church of God a biblical topic via live video streaming during a Thanksgiving service. Bro.Eli also mentions another reason for his thanksgiving – protection. Four members of the International Evangelist’s household staff offered thanksgiving after encountering a road accident also in January that had their vehicle spinning and toppling over . The household members recounted how scary the situation was at the time. Miraculously, the driver and passengers survived the accident left with only few bruises and scratches. Surprised yet thankful that they did not suffer any major injuries, they realized right then and there that God protected and saved them from harm. In everything, the congregants of the Church are taught to be thankful. And Bro. Eli’s thanksgiving was a soaring example why in every achievement and progress made, there’s a loving God behind.